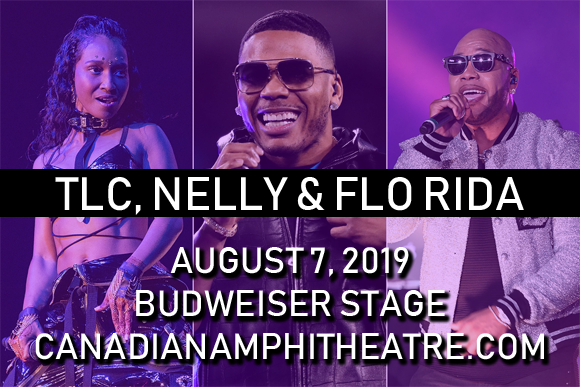 It's a celebration of R&B and hip hop royalty as Nelly, TLC & Flo Rida head to Budweiser Stage on Wednesday 7th August 2019 as part of their unbelievable co-headlining summer tour! Get ready to dance down memory lane as three of the biggest chart-topping acts of the 1990s and 2000s play hit after chart-topping hit – it's gonna be one non-stop party! Relive those glory days and sing your heart out! American singer, songwriter and rapper Nelly began his music career in 1993 as part of the Midwest hip hop group St. Lunatics, before signing a solo deal with Universal Records in 1999. He released his debut solo album, Country Grammar, in 2000, launching top ten hits with the title-track and the single "Ride wit Me". A three-time Grammy Award-winner, he is best known for his number-one hits "Hot in Herre" and "Dilemma" (featuring Kelly Rowland). TLC is the best-selling American girl group of all time and the second biggest selling girl group worldwide (after English group the Spice Girls), having sold over 65 million records. Formed of Tionne "T-Boz" Watkins, Lisa "Left Eye" Lopes (now deceased) and Rozonda "Chilli" Thomas, the group had nine top-ten hits on the Billboard Hot 100 throughout the 1990s and 2000s, as well as four number-one singles ("Creep", "Waterfalls", "No Scrubs", and "Unpretty"). Four of TLC's albums have been certified as multi-platinum by the RIAA, including CrazySexyCool (1994) which still remains the only album by a female group to receive diamond certification. Rapper Flo Rida is one of music's best-selling artists, having sold over 80 million albums worldwide. Bursting onto the scene in 2008 with his breakout single "Low", which was number one for 10 weeks in the United States and broke the record for digital download sales at the time of its release, he has since released four hugely successful albums and has had several international hit singles, including "Right Round", "Club Can't Handle Me", "Good Feeling", "Wild Ones", "Whistle", "I Cry", "G.D.F.R." and "My House".